Panasonic is one of the leading electronics Major and Japan’s largest cell-phone makers is geared up to expands its Lumix digital camera brand to the Mobile Phones. 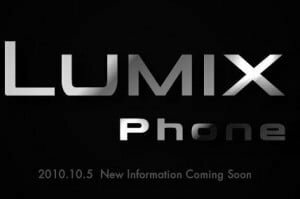 The company today announced that it will unveil its first “Lumix Camera Phone” at next week’s Ceatec electronics show in Japan. The upcoming Lumix phone will be loaded with a 13.2 mega pixel camera with CMOS sensor and a 3.3-inch screen. It has a digital zoom & features a mobile version of Panasonic’s VenusEngine image processing chipset. The device will measure 11.6 cm by 5.2cm by 1.8cm and will also offer picture sharing over Wi-Fi and DLNA networks (Digital Living Network Alliance). Panasonic has set up a Japanese teaser site than reveals little about the phone other than that its features will be revealed on October 5. There are no pictures of the mysterious phone available now. Samsung offer 10MP digital camara with 4X zoom,Samsung ES20 at Rs.3500.